I had someone ask me the other day why I support the use of medicinal marijuana. “We could have kids and innocent people overdosing, and that alone makes it unworthy of any support,” she said. That was sort of the Cliff Notes version of a very long and drawn out conversation I had with a very well-meaning, yet totally uneducated person regarding medicinal marijuana. This person could not understand why parents would administer something to their children without clear dosage guidelines, and when an overdose could cause them to die. While we commonly associate an overdose with drugs, pharmaceutical or otherwise, it is possible to overdose on some seemingly harmless, even healthy food items such as potatoes, oranges, licorice and even water. Yes, too much of even a good thing can cause some serious reactions in the human body. Did you know, however, that it is physiologically impossible to fatally overdose on weed? That’s right, there is no physiological way that you can fatally overdose on weed. One reason that you can’t actually overdose on cannabis is because of the fact that the body actually produces its own “endogenous” cannabinoids — chemicals that are otherwise unique to the cannabis plant. Interestingly enough, these same receptors are also found in every animal species, all the way down to the sponge. In essence, the endocannabinoid functions like a central processing center that keeps many important systems in balance. When the THC binds with receptors, as explained above, there is a release of pregnenolone, which weakens the THC’s action on the receptors — this creates a negative feedback loop that could prevent users from getting too high. Although the study was originally conducted to look at ways to manage cannabis “addiction,” this new information adds valuable insight into the fact that an overdose is not possible. Mitch Earleywine, a professor of psychology at the University of Albany, SUNY, states that there are very low rates of cannabis addiction and a drug for abuse may not even be necessary. But… haven’t people died from cannabis? I would be remiss not to mention that there have been “reports” of people dying as a result (supposedly) of cannabis. A year ago, the Huffington Post reported on claims that some doctors were blaming the deaths of three people on marijuana despite the fact that millions of people around the world regularly use this drug, which is known for its low toxicity. The doctors noted that in very rare circumstances marijuana can cause death. 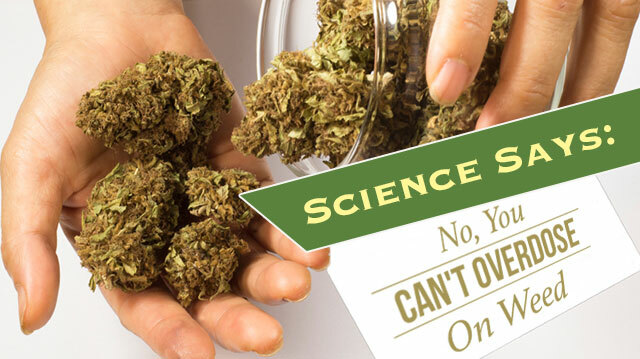 However, the larger scientific community is divided as to whether or not there is enough evidence to implicate cannabis in these cases. Many have said the fact that one of the persons who died had an underlying heart condition increased their risk of cardiac arrest. Another of the three who died had a history of heavy drinking, as well as cocaine and amphetamine use. The third person had suffered from severe depression. All of these factors can increase the risk of cardiac arrest, so it may be that cannabis triggered an underlying heart condition in all three. British neuropsychopharmacologist David Nutt explained, “People with vulnerable hearts should be informed of this risk.” On his blog Drug Science, Nutt also said that it could be an overreaction to paint cannabis as a killer. Cannabis poses very minimal physiological risk, especially when compared to alcohol and cigarettes, which cause tens of thousands of cardiac deaths annually. A 2009 study published in American Scientist, demonstrated that consuming 10 times the “effective” dose of alcohol is potentially fatal, while a user would need to ingest 1,000 times the effective dose of marijuana to even risk death. There has not yet been a documented overdose death due to marijuana (see information above regarding deaths). While medical marijuana is typically better quality than the marijuana sold on the streets, there are still no guarantees that it is not laden with chemicals, toxins and other impurities. Those farming marijuana can add commercial-grade synthetic insecticides (like Diazinon), fertilizers and phosphates to the crops. If these chemicals are not used exactly as indicated, the results can be toxic. There is also the risk for toxic mold and other impurities contaminating a marijuana crop, which could in turn cause damaging health effects in those who use the marijuana. In Los Angeles, scientists collected samples of medical marijuana to test them for chemicals. Some samples contained 1,600 times what is considered the legal digestible amount for pesticide residues. Many of these residues came from products that should not have been used to grow marijuana at all. Individuals who are prescribed medicinal marijuana already have health issues, and therefore are oftentimes more vulnerable to the pesticides. This is especially true for people who suffer from liver disease. Marijuana is just like any other crop when it comes to the dangers of non-organic farming methods. A crop can be coated in substances that have the potential to make people sick — or sicker if they already have a health condition. There is now, however, an inspection service known as Clean Green, which sets out to certify marijuana as organic. The goal of this service is to ensure that all marijuana is farmed both ethically and safely. If you are in the market for medicinal marijuana, be sure to look for Clean Green’s stamp of approval! I would like to stress that just because it appears to be impossible to take a fatal dose of marijuana, it is not an excuse to be irresponsible. If you or a loved one suffers from a condition that may be helped by the use of medical cannabis, I urge you to consult a qualified practitioner and use your prescribed cannabis only as recommended by your practitioner. Hey Buddy!, I found this information for you: "Science Says: No, You Can’t Overdose On Weed". Here is the website link: https://www.thealternativedaily.com/you-cant-overdose-on-weed/. Thank you.